Pier Natural Bridge Park is located along Hwy. 80 North, at Rockbridge in Richland County. The park obtains its name from the Pier family, who donated the land to Richland County to preserve the site as a park. The site has a very unusual geological feature – a half-mile long “finger” of blocked and layered sandstone rising nearly 60 feet above the flood plain of two merging valleys. This narrow finger is topped by tall pines and covered with green shrubs. The West Branch of the Pine River meets with the Main Branch underneath this rock formation, which forms a Natural Bridge. The Park has two historical markers – one indicating the unique rock formation and the other recognizing the significance of the Blackhawk wars in this area. 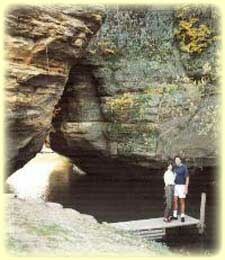 The park has a man-made tunnel which allows visitors to walk through the rock formation to the West Branch of the Pine River. There are also stairs to walk to the top of the rock formation to view the surrounding area. This 10-acre county park has 6 campsites, two shelters, picnic tables and grills, play equipment, and pit toilets. Camping permits may be obtained for a minor fee from the Natural Bridge Store, located next to the park. All camping is on a first-come basis. For additional information, contact the Richland County Parks Commission or the Natural Bridge Store in Rockbridge at 608-647-4673.